(b) don't worry about me going anywhere! To those of us that know you and have been on the receiving end of your generosity and knowledge then you need explain nothing Haywood. All else, I fear, falls on deaf ears. Now that's a euphemism I've never seen before. Both sides of some vinyl....? Rory has logged onto the forum at least twice today. In the light of his previous enthusiasm to post in this thread and demand examples etc, one might imagine that he has read all above. Nearly ten years on the forum and a generous 118 posts (including the recent flurry). I think this thread deserves his 119th. I respect your knowledge and huge contribution to both the forum and fundraiser. You seem like a decent fella and frankly so does Rory too. Perhaps this thread of the discussion could be parked? Haywood I offered an apology some posts back which you grudging acknowledged with ‘smashing’. I thought it would be more sensible to let this thread fizzle out. That was post #116 and you have posted a number of times since then, specifically questioning work I do and my contribution to the forum even when others vouched for it. Your posts required and indeed asked for a response. There's enough bad blood on the forum between other members with "Bracelet-gate" at the moment, so if that's all, we can be done. JWillans' post above noted. Last edited by Haywood_Milton; 11th February 2019 at 11:09. Reason: JWillans comment added. To get back on the Rep problem, too bad we didn't had the chance to see the movement of that "Daytona". Would love to see what the fake world has to offer in terms of producing parachrom hairspring. You can see all you need in the OP's photo of the movement, surely? Oops, for some reason my browser didn't load last two pictures. All clear now (in regards of hairspring). I don't suppose there's a chance that you'll attempt to justify your comment with a coherent argument of some sort, is there? Firstly, the poster states that it's fine to buy fakes knowingly because one isn't prepared to spend the full cost of the genuine watch. "Like it or it (sic) it’s another branch of this hobby." - No, it isn't. It's illegal to build such watches, it infringes the copyrights of their designers, it free-rides on their marketing spend, the fake industry doesn't pay taxes or customs. They are illegal. Buying and wearing fakes has nothing to do with 'this hobby', it isn't even the same sport. The second statement insinuates that the 'real crmininals' are those, who are trying to sell these watches to unwitting customers as the real thing. I disagree, the real criminals are those who produce them in the first place and those who build distribution networks. It's organised crime. I’m really trying to let this thread peter out, but I will not tolerate being mis-quoted. I didn’t say it’s fine, I said it’s their choice and that it was very different than buying to profit from deceiving someone else. Both are related to illegal activity but are very different levels of engagement, for want of a better term. There will be many on here smoked a joint, although illegal and they are ‘supporting’ a multi billion pound illegal industry it doesn’t make them El Chapo! I didn’t say that either Raffe. If there is a suggestion of 'resigned acceptability' then I would suggest it depends when and where this is discussed. I might be slightly obvious from this (and other threads) that there is little appetite for them and the discussions thereof. After 8 years of membership have you not picked up on this Rory? Sorry Chris, not sure I understand....and that’s a serious question too. And how many posts have I made about this Chris, even with my measily post count (which you seem to want to increase) I think you’ll find it’s one. One single post where I said people had a choice to buy fakes, not that they should or that fakes are great. I’ve made my position crystal clear so not sure what the motivation is with your continued baiting, however I will not be responding to any further posts in this thread from you or your ‘crew’. I wish you, Raffe and Haywood a pleasant evening. My post was in relation to what you have read on here over the years, not posted. Is it not reasonable to assume that?. As for having a 'crew' ? Converse or not, post or not, but when the responses do not accord with your views please do not play the 'victim' card. Last edited by Chris_in_the_UK; 11th February 2019 at 21:38. I’ve stumbled across some pretty convincing fakes on Gumtree - on further inspection it appears there is a significant trade there - some sellers even have branded themselves with multiple listings and ‘AAA’ quality ratings - all boxed with paperwork . Surely the only reason to offer anything above the watch is to further deceaive the subsequent purchaser ? ....but supplied in 2016, outside the UK. A service through a Rolex service centre might be definitive ONLY for the person who has it carried out. It is not unknown for the unscrupulous to have a watch serviced, swap out parts and then offer it for sale the same day with apparently impeccable credentials. For example, if someone has a Rolex with a diamond bezel serviced and on return immediately swaps that bezel for one of the better generic ones, how many buyers would spot it? How many would be reassured by the Rolex service card, even documentation describing the diamond bezel? The rotter has obtained a £6,000 part for the price of an £800 one. It is also clear that not all Rolex service centres have the same level of skills. Rolex UK may be excellent at identifying correct military-issue Submariners, where others elsewhere in the world may not. So you are telling us not to rely on a rolex service alone as evidence the watch is genuine. But rather to only buy from a reliable source? Is there a list of reliable sources? It all sounds pot luck! Why do you think main agents and accredited repairers will have the experience and skills to identify fake parts? 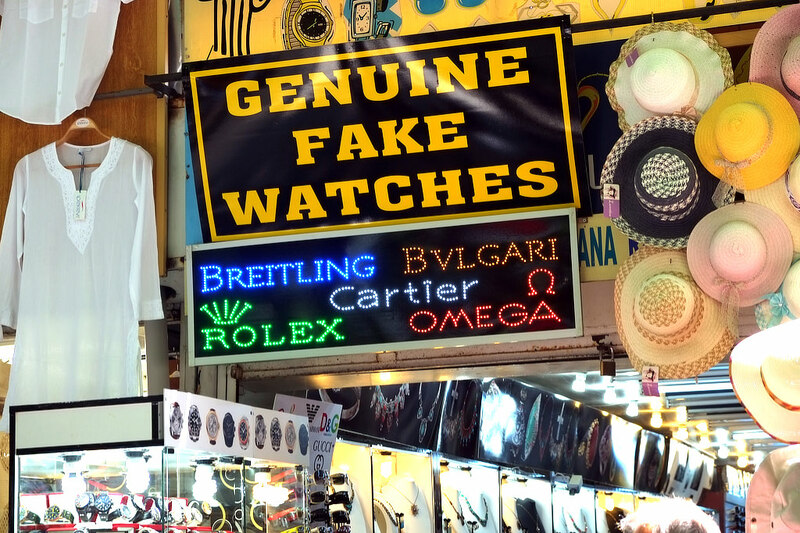 It sounds like the only sure way of knowing your rolex is 100 percent genuine. Is to be the first owner who ordered it new off rolex from an AD? Otherwise there will be doubts? Yes, factory fresh from a Rolex AD is the safe way of buying. Just pop-in, order whichever model you fancy, and that’s it. Firstly, the poster states that it's fine to buy fakes knowingly because one isn't prepared to spend the full cost of the genuine watch. You’re incorrect, that’s not what he said, he didn’t even elude to it being ok, just accepting that it’s a reality - like it or loathe it. I understand the points made about AD's and their reliabilty for determining fake parts etc. Its like taking your old car to the main dealer. Who are used to routine servicing and telling them it needs an automatic gearbox strip and rebuild. So Heywood. Are you saying the same can be said of authorised Rolex service centres? Is it like taking your lets say 1973 classic car to a main dealer used to working on only new cars. Are Rolex service centres mainly concerned with new watches. And routine services. Is there a more specialised service sector for vintage models. Like there is with cars? I've often thought that the watch community is taking a huge risk when purchasing expensive second hand watches. If industry professionals are finding it difficult to tell a dodgy watch from a real one, I don't have a chance! Added complication in that the seller may not even be aware of the watch being wrong so the 'buy the seller' thing doesn't 100% stand up either. Buying from an AD at rrp is surely the best route. If you were the one who had the Rolex service done for you, that would be fine. If a dealer or seller of bona fides had it done, this should be fine. Just be aware that a watch can be messed with in less than an hour, so ask yourself if you are confident in those hands it has been in since Rolex service, if any. Yes, I would suggest otherwise buying only from sources who seem to have sound knowledge, have a reputation to protect and are big enough that in the event of a dispute you could realistically bring a claim against them and expect to realise what you were due. Buying from private individuals is not for the faint-hearted. What is their level of knowledge? Where did they get the watch from? Will they be willing to repay you in the event of a problem regarding authenticity or legal title? Will they be able to repay you? There could never be an agreed list of sound sources, but regular involvement in watch fora might throw up some useful indicators. As with many things, what seems at first like pot luck can in fact be made rather more scientific, if you are prepared to make the effort. It doesnt sound all that safe with the doubts cast on AD's to you then? The professionals in the industry should not be having any difficulty. Sadly, there are many who appear professional, with smart shops, heavily marketed brand names etc, who don't have much of a clue and think that a sign in the window declaring themselves "pre-owned watch specialists" makes them so. "See you in 2029 for that Pepsi then, Sir !" That is what i thought. Thank you Heywood. Provenance and originality are ever evolving. Makes perfect sense. I pity sellers who know their watch to be genuine. After this they will be forced to sell to a retailer looking to make a profit. What about the man who just paid rolex £600 for a refurb on a 10 year old sub. Only he can be assured of its originality. He will now be forced to accept a possibly lower price by selling to a trader than a private buyer. As that private buyer can not really be sure. Originality has not been subsequently diminished? Not at all, because the world does not turn on what I write or think. Thousands of buyers will continue to be satisfied by a three year old service card, a posh-looking shop, ebay feedback, a forum name with a thousand posts, a BQW authenticity card, some YouTube videos about watches filmed in a country layby while apparently waiting for doggers, a convincing icon next to a Chrono24 trading name, a recommendation from a friend in the pub or simply their instinct that the seller couldn't possibly sell them something that wasn't what they thought, knowingly or otherwise. This is overly cynical in my view. The original sales receipt from my cc £3,090 in 2008!!!! All in my name and matching the watch's serial number. Good sales can still happen in the private market, and shops outside the NW of England. In no way do I disagree with you and that would be a great purchase. The trouble is that while you know that the watch is 100% correct, nothing above proves as much to the buyer. This is not about scaring people to buy from the trade alone. Buying with much greater diligence than most do, and with an awareness of what can happen, is what I suggest. If you read back through the thread, it is others who have tried to interpret this as much more and indeed I have tried to rein in such binary positions. Threads like this lead me to a broader question - do I really want to spend £10,000+ on something that can be duplicated to a standard that only a handful of experts can discern, for a tiny fraction of the cost? Rather than encouraging me to buy from an AD or specialist, it's more likely to ecourage me to keep my money. Sought after genuine watches will continue to appreciate, so buying new seems safe. The problem potentially comes when you come to sell or if you want to buy secondhand, with doubt being cast on any level of provenance - warranty cards, receipts and even servicing how does one ensure that they are getting a 100% genuine watch. There’s a business opportunity in there somewhere but I can’t give it much thought now as I’m queuing for fish and chips! All I know is that if I could pay a reasonable fee - perhaps 5% of the watches value for a cast iron guarantee that it was genuine then I would do. Last edited by Rory; 12th February 2019 at 18:36. Reason: Spelling! I reported about 10 fake Rolex’s to Gumtree last week. Plus about 10 the previous month. They don’t give a jot! Heres a thought, and I’m not suggesting this has happened. What if an AD gets a sought after model in, but, unknowingly they also have a “less than desirable” member on their sales team. The sales person swaps the original for a ”superfake” and passes this onto an unsuspecting customer, pocketing the original. Where would the customer stand then, the AD would no doubt argue they sold an authentic genuine piece as supplied by Rolex, the dodgy salesperson could be a few grand richer, and the poor guy who bought his/her dream watch left in the lurch. Like I say, just a thought, but is even buying from an AD guaranteed 100% safe anymore, in fact, is it safe to buy at all !! I think there was a case of this happening in an AD in Australia. I read about it two or three years ago, so the details are hazy, but I think the AD was very keen to make everyone as happy as possible as quietly as possible. I've just tried to find the story, but not being able to remember any usefully searchable details, didn't get anywhere. Last edited by Der Amf; 12th February 2019 at 19:33. The papers would give it away. Either the buyer would get the original paperwork and then watch and papers wouldn't match - or he would get fake paperwork and then invoice and watch/paperwork wouldn't match. Provided the AD would have a system to make sure correct serial (as delivered from Rolex) would be on the invoice (expected) and buyer would check serial number against paper work/watch (strongly recommended, if only to avoid other trouble like mixed up watches). To do this they’d have to have a fake ready with the same serial number surely!? I guess they could swap the movement, blimey how paranoid do we want to get though?? Meant to say earlier - thank you! So if I say that if "someone is stealing a watch because they want a bigger collection, test drive, stunt double, watch they’ll never justify a level of spending on, that’s their choice. Like it or it it’s another branch of this hobby" - then I have not implied that I think it's okay that they stole the watch?